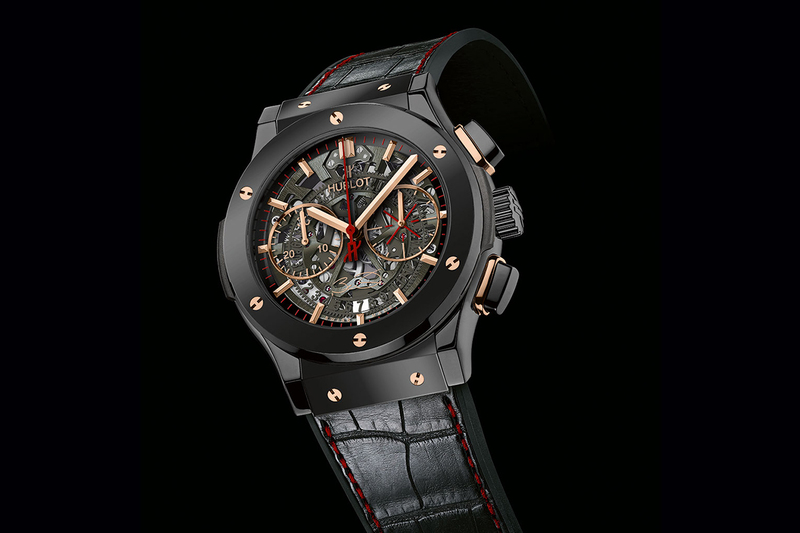 The Hublot Classic Fusion Dwyane Wade is finished in sleek 45mm polished black ceramic. The red, black and regal gold colour scheme mirrors that of the Miami Heat, Dwyane’s basketball team. Features of the dial include a Dwyane Wade logo at the 3 o’clock position, and Dwyane Wade’s signature is printed at 6 o’clock. Classic Fusion Dwyane Wade Black ceramic 2014, 45.0 mm. Sapphire Dial with Dwyane Wade signature at 6 o’clock. Hours, Minutes, Seconds, Automatic Date at 6:00, Chronograph. Sapphire Crystal – Transparent Exhibition Back revealing rotor. Polished Black Ceramic with 6 H-shaped 18K King Gold screws. Strap Black rubber and alligator with red stitching. Clasp Black PVD Stainless steel buckle.